Drain the chickpeas. Puree the chickpeas and garlic in a food processor until mealy but almost smooth. Add the tahini, water, salt and pepper to taste. Season to taste with cumin and hot sauce, and pulse. Slowly add the lemon juice, vinegar and olive oil, alternating between each, pulsing on and off, and tasting as you go, until desired flavor is reached. Transfer the hummus to a bowl and keep covered and refrigerated until ready to use. The hummus may be made a day or two ahead of time and stored in the fridge. Remove the hummus from the refrigerator 45 minutes before serving. Ideally, it should be at room temperature. Peel the eggplant and cut into wedges lengthwise. The wedges should be about 1 ¼-inches / 3 cm wide. Marinate the eggplant wedges in the olive oil, vinegar, salt, pepper, and garlic for 20 minutes at room temperature. In the meantime, preheat the broiler or grill. Skewer the eggplant wedges and broil or grill 8 inches / 20 cm from heat source, until tender and golden brown. 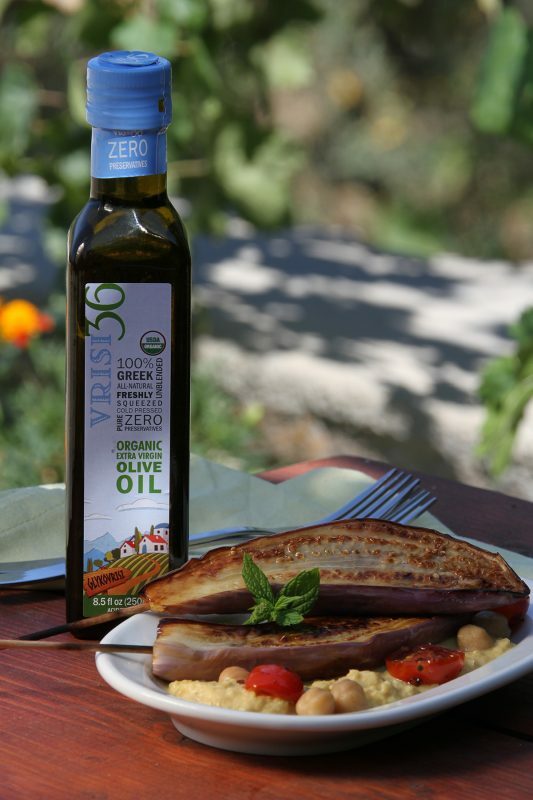 While the eggplant skewers are cooking, heat a nonstick skillet and the oregano and Vrisi36 olive oil. Add the cherry tomatoes and sear on high heat until the skins wrinkle and brown slightly. Season to taste with salt and pepper. You can drizzle in a little Vrisi36 Balsamic Vinegar if desired. To plate: Serve the hummus and top with the skewered, broiled or grilled marinated eggplant wedges. Garnish with the seared cherry tomatoes.